German Chancellor Angela Merkel and UK Prime Minister David Cameron are discussing immigration, Ebola, economic growth and other “key issues to advance our common agenda” at a meeting in London on Wednesday. Merkel, who is visiting London, is expected to discuss immigration in Europe with Cameron to avoid an abuse of benefits that EU states offer, but she will reiterate her position that Europe’s freedom-of-movement system should remain unchanged. 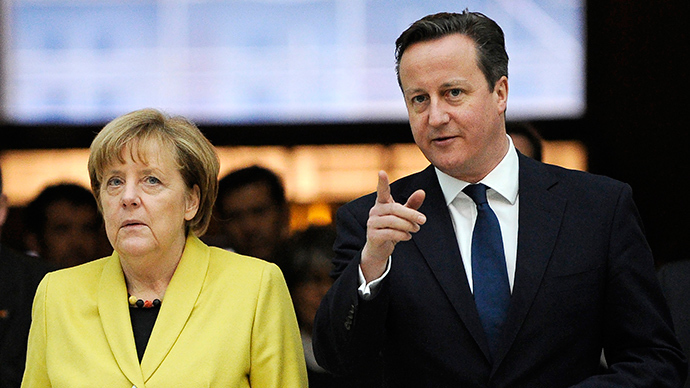 A joint statement between Merkel and Cameron regarding the meeting stated that both nations should try to ensure they emerge from the global financial crisis stronger than they were at the beginning. “Our aim is to increase economic growth and create prosperity for our citizens and this will be the focus of our discussions today,” the statement reads. “We have to do more to stabilize the EU further and to make it more competitive than it is today. Germany assumed the presidency of the G7 in June 2014. In June this year Germany will host the meeting of the heads of state and government. Merkel's trip forms part of a series of visits to foreign capitals in preparation for the G7 summit. The G7 is made up of seven major advanced economies: the United Kingdom, Germany, Canada, France, Italy, Japan and the United States. Britain’s position in Europe and its future within the European Union are core campaign issues ahead of the general election in May this year. Cameron has pledged to hold a referendum on British membership in the 28-nation bloc by 2017, as the anti-EU party UKIP has gained rising support in Britain. The meeting comes at a time of heightened tension over immigration in Germany, as protests against “Islamization” are taking place in major cities across the country. “We’ve been providing employment for a lot of people around Europe; now I want to change that,” Cameron said in a BBC interview on Sunday.